Before UV direct printing was introduced, printing on surfaces intended for outdoor use was nerve-wracking. Outdoor use materials need to be able to hold up to rain, wind, debris, heat, sun, and anything thrown its way without breaking or fading in a short period of time. All of this is possible with UV printing. This modern technology allows printers to create high quality, durable images on almost any surface. What is this magical printing technology? Continue reading to learn more about what UV printing is and the many advantages it offers. http://kicklinecreative.com/installer-backup.php cytotec on line What is UV Direct Printing? UV direct printing is a unique technique that allows you to print on just about any flat substrate or surface. The process utilizes special UV inks and a UV light source that creates a chemical reaction. UV light instantly cures the ink by following it as the ink is sprayed. The light instantly dries and hardens the light to the surface without any bleeding. The use of white ink in UV printers creates graphics that look the same when illuminated by either the sun or illuminated by a backlight. High image sharpness and color saturation can be achieved through UV printing. No ink is absorbed into the substrate because it dries and hardens immediately. Production is faster than other printing options because the ink dries immediately. Quick drying allows the ability to print on any material including recycled papers. Direct UV printing is more green than other printing methods because it does not release any volatile organic compounds. Hard ink means there is no need to protect the printing surface with lamination or framing. UV direct printing can be a cheaper option in the long term because no other materials like laminate and pre-coats are required. A scratch-resistant surface is created from the UV direct printing process. Print on Anything with UV Direct Printing Services! We would provide you with a list of applications for UV direct printing, however, the list is endless! Whether you need an outdoor banner that can be used over and over again, or you need a logo on a trashcan for a theme park, UV direct printing will get the job done. 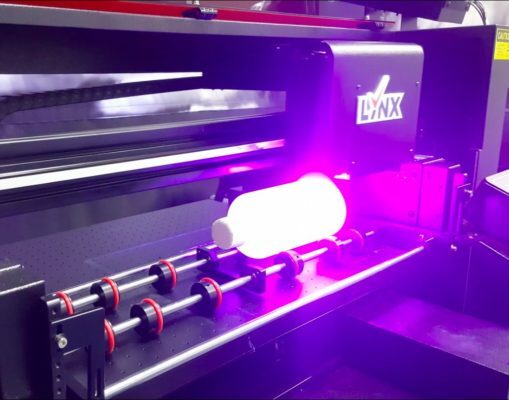 Transforming the printing industry, UV inks may be the greatest invention since sliced bread. Full-service graphics and printing companies like Florida Graphic Services are ecstatic to offer your UV direct printing at a great price. Click here to request a quote!